Eir’s name means “help” or “mercy.” She is one of the handmaids of Frigga, and is also listed as one of the handmaids – or Valkyrjur – of Óðin. She is attested to in the Prose Edda, the Poetic Edda, and Svipdagsmal. Additionally, she is attested to in skaldic poetry, and runic inscriptions. She is named as a goddess who oversees childbirth. As a Valkyrie, Eir accompanied her battle-sisters. While the other Valkyries chose the slain, Eir would choose who would live and recover and return to health. As a chooser of life and death, she is sometimes associated with the Norns. Although Snorri does not explicitly name her as one of the asunjar, he does not name every goddess counted in this number. He does however go on to say that Eir is among the most important of all goddesses. Her name is a commonly-used kenning for “woman” and “women”, which is intriguing when one considers that in proto-Heathen times, the realm of healing was by and large honoured as the realm of women. Folk tradition holds that Eir was invoked in healing rituals using a white flower known as Eirflower. She is associated with copper, which was used in healing rituals and ceremonies. In the Poetic Edda, she is attested to being the companion of another spiritual being, a particularly kind and compassionate jötunn named Menglöð. The two of them are invoked for healing together. It is theorized that Menglöð may be a hypostasis of Frigga, of Eir, or else a jötnar goddess of healing unto herself. She is associated in the myths with a sacred hill, where she gathers with many wights of healing. This hill, called Lyfjaberg, may be her abode, such as a hill of the Alfar, or perhaps a realm in Ásgard. There she is said to attend to a particularly compassionate, kind jötnar who was called upon for healing as well. In one telling, she guards the castle of Menglöð, atop the mountain Lyfjaberg. The other maids (wights?) are named Hlif, Hlifthursa, Thiodvarta, Biort, Blid, Blidr, Frid, and Orboda. In the lore, it is stated that annual blóts where offered to these maidens atop Lyfjaberg to keep all sickness and pestilence away from the community for the year to come. In skaldic poetry she is depicted as a companion to another of Frigga’s handmaidens, Vár, the goddess of wedding vows and legislation that benefit women and families. Eir is implied to be counted among the Asujnur, the major goddesses of the Æsir. Her distinction as a servant of both Frigga and Óðin, as well as her sphere of influence, have earned her a place of great esteem among modern Heathens. There are several other deities are sometimes called upon for help with healing: Frigga for home-remedies and midwifery, Jörð and Iðunn with rejuvenation, and Máni for spells of healing. 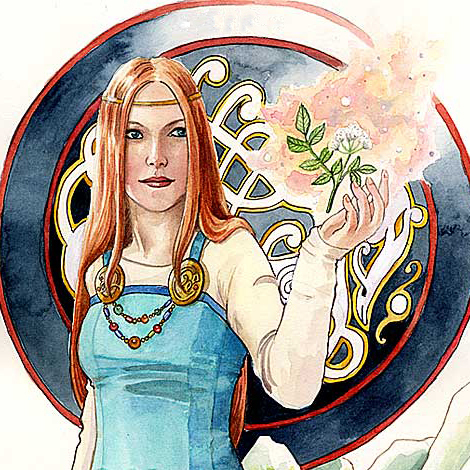 Eir however is the preeminent and principal healing goddess in Northern tradition. Before the rise of the male dominated medical institutions of Europe, the healing and medical care of the community in Norse and Germanic countries was largely the sphere of women. Although the Sagas record several male healers, during the pagan period the role of doctor was women’s work, while men were usually nurses or helpers. Healing methods among the proto-Heathens included: healing through prayers, magic, midwifery practices which were more advanced than those that followed after, surgery, herbalism, home remedies, healing methods using copper bracelets, and detoxes using saunas. Modern scholars compare her with the Greek goddess of healing, Hygieia. She may be related to the Indo-European Swiss goddess, Erecura, known to the Celtic people as Aerucura. Iaer, Aer, Eira, Eria, Eyra, and Eil. Mortars and pestles, healing instruments, and bandages. Saunas. Healing herbs, home remedies, and folk medicine. Copper. The colour red. Hill tops.